The Ghost of Poland, Jews and Death Camps : NPR Public Editor Making historical references has pitfalls, but a reporter and listener find a shared history. 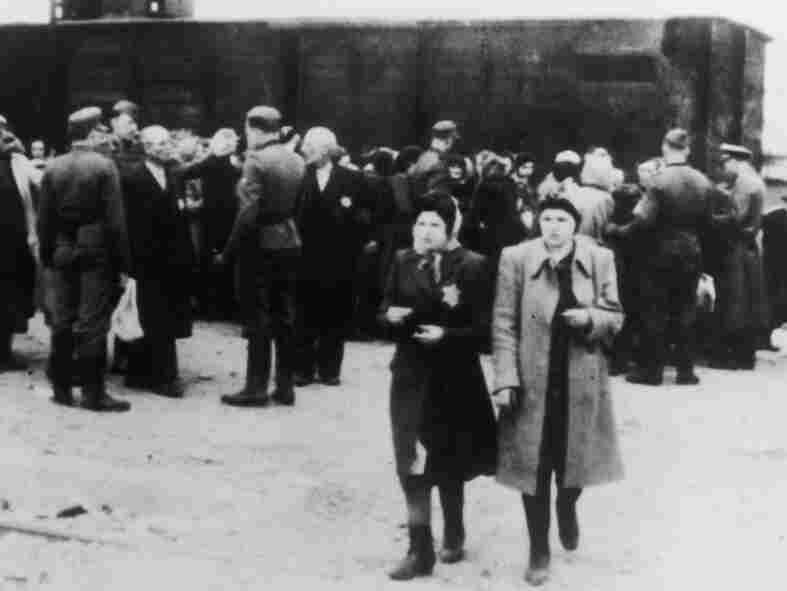 Newly arrived deportees and guards at the Nazi concentration camp at Auschwitz, Poland, circa 1943. Although I see an attempt to be politically correct in depicting the German Nazi camps by NPR, the use of the national adjective "Polish" is a no no. If there is any national adjective to be used it should be GERMAN. Considering the border changes Poland has undergone over the centuries and in particular before and after WW II, using the word Polish as a geographical marker is more than likely not accurate for the time these camps were operational as a German camp. As the son of a member of the Polish underground whose unit "Zoska" was acknowledged by Yad Vashem for saving Jews during the 1944 Warsaw Uprising I would like to point out that calling the German concentration camps in German occupied Poland "POLISH" is insensitive to the families of the millions of Poles who were killed, forced into slave labor, tortured, maimed, terrorized and starved during the brutal and inhuman occupation of Poland by Germany in the name of "Deuthschland, Deutschland Uber Alles" and "Lebensraum" for Germans. The camps were "German" and they were in German occupied Poland. Please change the text. The phrase "Nazi occupied Polish Death Camps" is awkward, vague, misleading and offensive. The word "Nazi" without the word "German" specifically opens the wounds of the outrageous and false charges made by Stalin, the Soviets, US Communists, and their liberal dupes, that Poland and Poles were fascists and Nazis, when, in fact, the Soviet Union was initially an ally of Nazi Germany, while Poland never was. In post war Poland, Polish anti German heroes were executed, tortured, imprisoned, mocked and vilified as "Nazis" by the Communist oppressors, while the rest of the world began living normal lives. Thank you. Other than that, I am a fan of NPR, which has opened me up to criticism from my more conservative acquaintances. Words and all their nuances matter. We inadvertently struck a nerve with some of our listeners by using the phrase "Nazi-occupied Polish death camp," in a story we used in our 10am newscast on Wednesday, October 5th about German authorities reopening dozens of dormant investigations into former Nazi concentration camp guards and others. We would have been on much safer ground saying "Nazi death camps in Poland." The construct of our offending sentence was, frankly, due to the deadline pressure of hourly broadcast writing and was devoid of any underlying motives or interpretations. Our excellent newscaster, Paul Brown, mentioned to me in a conversation we had about this, that he retrospectively realizes how the sentence could have been interpreted and would have written it differently had he had the time to weigh the nuances. He also revealed to me that what was left of his own father's family in Lodz, Poland was wiped out during World War II. Were it not for an American immigration officer's impulse to change his father's last name to Brown, Paul might, to this day be locking out his broadcasts as "Paul Brzoza, NPR News, Washington." Of all people, Paul says, he especially empathizes with our listeners who took offense. We can assure you, no offense meant.